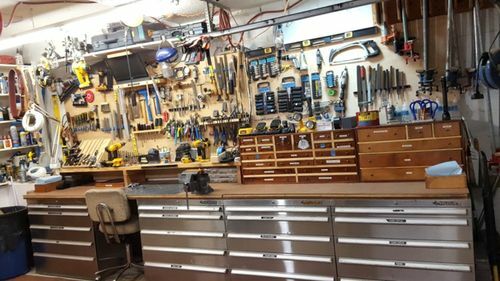 Done with my year-end projects, time to reorganize the tool wall over the bench. I noticed that I had so many tools hung up that I was knocking down two for every one I was reaching for. Plus, I inherited my son’s old 50” plasma TV which he replaced recently with some super-duper model that has features which are way beyond my old-tech brain. It was pretty amazing how painting the tool wall gloss white brightened up my shop. Here’s to all my Lumber Jock friends having a wonderful, safe and very Happy New Year. Wow Eric! That old wall sure looked good but I know what you mean by knocking things down as you try to grab the tool you need; I do the same thing! LOL! I like your idea to paint the wall white; it sure does make a huge difference. Looks like you have plenty of drawers to put all the tools in too! I hope you have a Happy safe and prosperous New Year! Organizing a shop is a work-in-progress. No end in sight. But I think you will agree that this task is fun and rewarding, even in drawers. No end there too. I wish you and all LJs a Great and Healthy New Year ! Nice shop organization Eric. Do you do other shops? Haha, I am so in need of organization unless organized chaos qualifies. Looking good my friend. That looks better Eric. Can you come over and do mine….LOL!! Looks great and very well organized. I love having lots of hand tools on the wall behind my bench, but I made a big mistake by making my bench a little too wide so that it is a little difficult to reach them. I just hope the stretching will be good for me! Wow Eric that looks like a showroom great job. 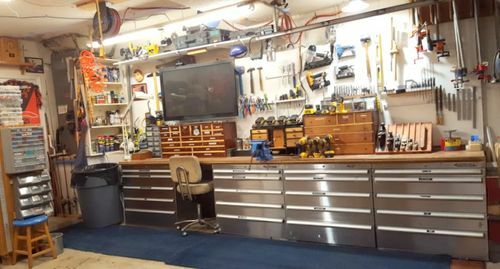 I’ve just spent a lot of time organizing but my shop looks nothing like you great shop. Looks super, Eric! I need to do this. Hey Eric, how about re-organising my shed like that. Free accommodation is offered mate, LOL. Wow, wonderful to see that order. Must be fantastic with all those drawers.